The Air Dodge is an ability in the Super Smash Bros. series, introduced in Super Smash Bros. Melee. If a player presses the shield button while their character is in the air, the character will do an Air Dodge. With the Control Stick, the player can give the Air Dodge a direction, moving the character a small distance wherever wanted; this is only possible in Super Smash Bros. Melee and Super Smash Bros. Ultimate. As the name may imply, during this move, the character spins around and dodges any incoming attacks or projectiles that there may be. After having performed this move, the character cannot perform any other attacks until after landing or having been hit by an opponent's attack. 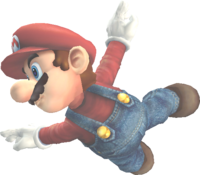 The Air Dodge is a vital part of an advanced technique in Super Smash Bros. Melee named the wavedash, which involves dodging diagonally into the ground to slide along it. This page was last edited on March 23, 2019, at 17:17.